I travel to Bend once a month for work. And for the most part, I love it. Situated in central Oregon, Bend gets 300 days of sunshine a year, compare that to the doom and gloom of Portland winters. Bend is also home to one of my absolute favorite coffee shops, Lone Pine Coffee Roasters, a dreamy postage stamp of a coffee shop tucked in an alley where they make their own almond milk and roast beans, which you can find in speciality markets in Portland. Despite a handful of good places to eat in Bend, living out of a hotel is no treat no matter what city you are in. A mini fridge and electric kettle do allow for some unique survival meals, but I have yet to figure out how to steam kale in my room at the Doubletree Inn. Breakfast: Vanilla Bean latte with homemade almond milk from my favorite coffee shop in Bend, Lone Pine. Followed by Kale with tahini and garlic dressing, topped with black beans and a scope of hash browns from the hot bar at work. Snack: Cup of mint tea and a KIND bar back in my hotel room. 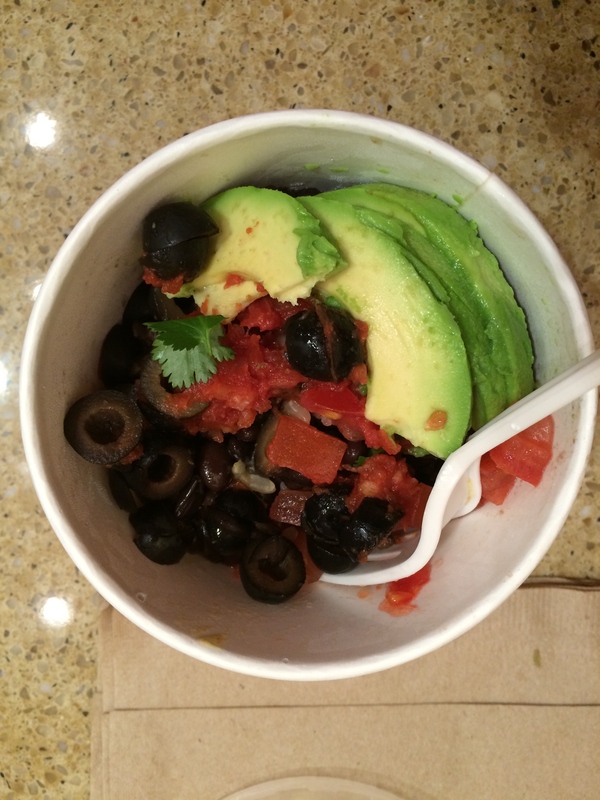 Dinner: Vegan classic bowl from Yumm, mostly brown rice, beans tomatoes, olives, green onion and avocado with Yumm sauce. Work snack: 3 too many handfuls Spanish cocktail mix- lava beans, garbanzo beans, corn nuts- not healthy, at all. Just tasty after working for 5 hours. Drinking: 1 glass red wine.